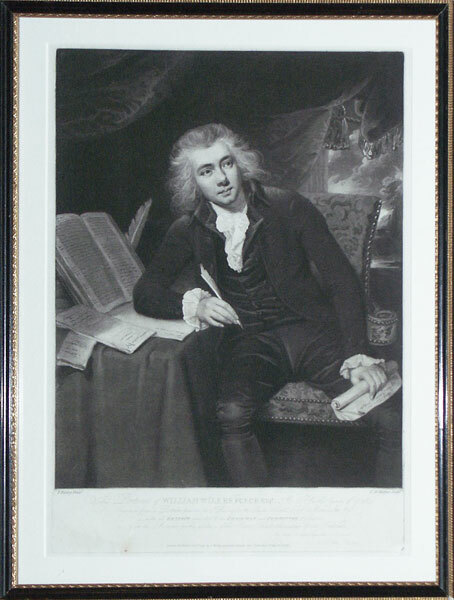 A mezzotint portrait of William Wilberforce by Charles Hodges after the painting by John Rising and published in London in 1792. This Portrait of William Wilberforce Esq. M.P. for the County of York., Engraved from a picture painted by J. Rising for the Right Honourable Lord Muncaster, is with all Respect dedicated to the Chairman and Committee of London; and to all the Societies for the Abolition of the Slave Trade throughout Great Britain, by their obedient humble servant John Rising. William Wilberforce was born in Hull in 1759, educated at Cambridge University and went on to become a Member of Parliament for Hull in 1780. He became leader for the movement for the abolition of the slave trade. In 1807 he was re-elected as MP for the county of York, assisted by sponsorship from the Fitzwilliam and Lascelles families. He retired from parliament in 1825 and died in Cadogan Place, Chelsea in 1833.